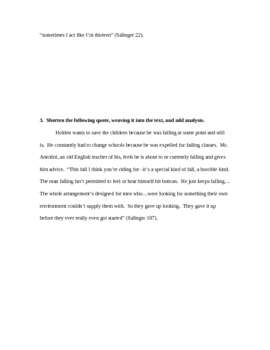 This download includes two handouts that have been integral in my classes with the teaching of writing strong literary paragraphs. 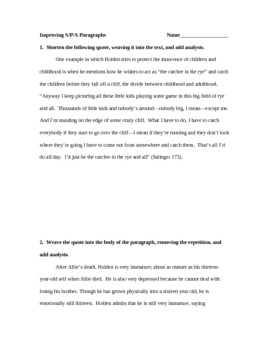 The first handout introduces the statement/proof/analysis format that helps students break down their paragraphs and to improve on the incorporation of quotes and analysis. 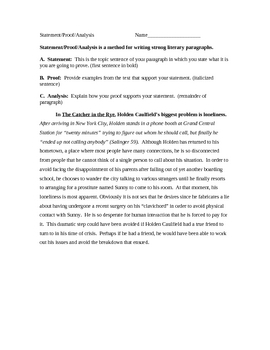 The second handout, which is a worksheet, has sample beginnings from student essays about The Catcher in the Rye that require editing and the inclusion of analysis. Once I started using this format in my classroom, I saw my students' writing improve significantly. I have consistently used this with my high school students (9-12), but it can also be used with junior high students.